In several previous posts we have mentioned the use of Structure from Motion (SfM) photogrammetry during the ENC project. Before I begin explaining what SfM is, I want to explain how we (ASWT) came to be using SfM on the ENC project. I was first introduced to SfM at the 2009 TAS Annual Meeting in Del Rio. I had just received my BA from the University of Colorado in May 2009, and had only 5 months of field experience as an intern working with SHUMLA—in other words, I was young and impressionable. I attended a presentation by Mark Willis where he explained how he used Microsoft Photosynth to create a 3D model from photographs he took using a hand held camera (for more info see Mark’s Blog: http://palentier.blogspot.com/). To me, Mark was describing something straight out of video games and movies, and I remember thinking how cool it was that archaeologists were creating 3D images using just a camera! Dr. Black’s (Steve’s) 2010 Texas State Archaeological Field School was the first time I was able to see Mark in action. That summer I was finishing my internship at SHUMLA and gearing up to enter graduate school under Black at Texas State. The field school was headquartered at the Shumla Campus on Jack and Missy Harrington’s Shumla Ranch and I was taking the field school unofficially as a SHUMLA representative. Back to Mark in action. He suspended a simple point-and-shoot camera about 100 feet up in the air from a kite and mapped the upland stone alignment site of Javelina Heights, which the field school was excavating. The basic principle by which a 3D surface is created using SfM is to take dozens—or sometimes 1000’s—of overlapping photographs of the object/area being mapped. These photographs are then put into specialized software that matches each photograph up to other photographs of the same area, and it builds a 3D surface from the 2D photographs. This 3D surface, which is essentially a topographic map, can then have geo-referenced real-world coordinates (e.g., meters or UTM coordinates) assigned to the model so measurements can be taken from the surface. Mark spent only a few hours on site, but he was able to produce a higher-resolution site map than the one we produced after 5 weeks and 1000’s of topographic shots with a Total Data Station. After Mark’s mapping of Javelina Heights on I was convinced—Steve slightly less so—that SfM was the way to go. Again in 2011 Mark came out to Dr. Black’s field school and used a kite to map Little Sotol (a terrace/rockshelter burned rock midden along a tributary to the Devils River where the field school was held). That year my fellow Coloradoan and graduate student Ashleigh Knapp and I were the field school teaching assistants and developing our Master’s thesis research projects (Little Sotol for her, the survey of Dead Man’s Creek drainage for me). I began to experiment taking my own SfM shots of different rockshelters I recorded as part of my survey, and even with just my basic understanding of the technique I was able to produce 3D point clouds of rockshelters. My early efforts were mere baby steps compared to what Mark was doing at Panther Cave as part of SHUMLA’s 2011 Field School (http://www.youtube.com/watch?v=vbmgpKKLMyY). But, Mark’s work at Panther Cave coupled with my own experimentation was enough to convince Steve that SfM could be used effectively to map sites. So, in 2012, during continued research along Dead Man’s Creek we began to use only SfM to map and document our excavations at three burned rock midden sites. SfM models of Hibiscus Shelter (left) and Tractor Terrace (right). The model for Hibiscus was created using 950 photographs, and the Tractor Terrace model produced using 750. The photographs for both models were taken after excavations were completed. After our work in the summer of 2012 along the Devils River, my TxState coursework was completed and I returned to SHUMLA to work part time as I completed my thesis; but, SfM was not forgotten. At SHUMLA we began to produce 3D models of all the sites where SHUMLA was recording pictographs. In part because we were constantly face to face with 3D models of archaeological sites, we began to realize what we were creating: a digital, interactive record of Lower Pecos archaeology. We were creating something that could be shared with the world. As for me, I finished my MA in December, 2012 and worked full-time at SHUMLA through August. I was one of the rock art instructors during the TxState Archaeological Field School at Eagle Nest Canyon that Steve co-directed with Carolyn Boyd. I am now back at TxState working for ASWT as the project archaeologist and Steve’s second-in-command. Fast forward to 2014 and the Eagle Nest Canyon project. We are using SfM to document and model sites, excavation units, excavation layers, profiles—essentially we are using SfM to photo-document anything and everything. Depending on the size of the area being mapped, we can produce 3D surfaces with sub-millimeter accuracy. In fact, SfM produces results rivaling LiDAR, but for a fraction of the cost. With the help of Mark Willis, we have taken photographs from a UAV and remote controlled helicopter to create maps of the Eagle Nest Canyon area with centimeter resolution. 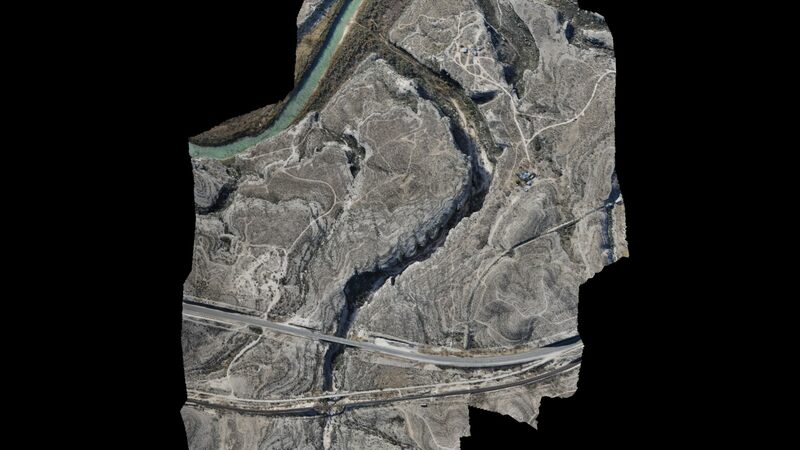 UAV imagery from Eagle Nest Canyon, courtesy Mark Willis. Using cameras suspended from a pole (PAP, pole aerial photography), we have mapped the talus of Skiles Shelter and the floor of Eagle Cave to sub-centimeter resolution. 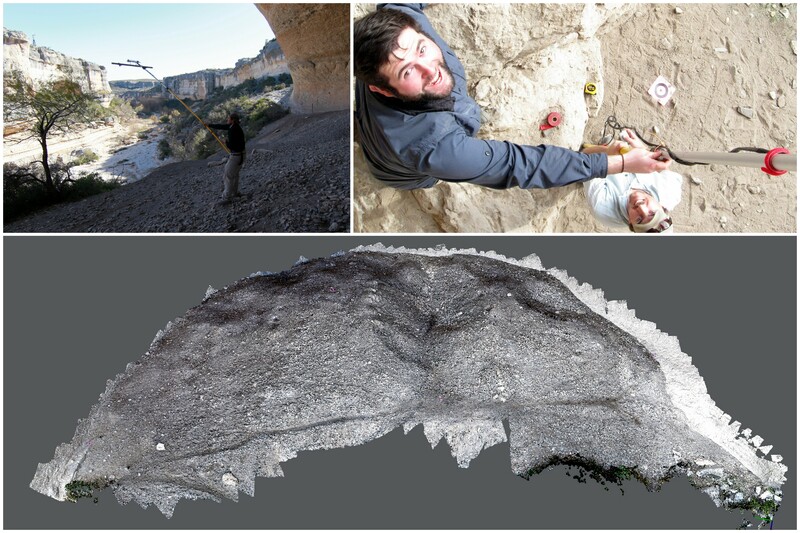 Charles using PAP to map the surface of Eagle Cave (top left); Jacob and Charles running PAP in Skiles Shelter (top right); a 3D surface of Eagle Cave generated from 1800 photographs. Using just a hand-held camera we have modeled all of our excavation layers and profiles so we can better understand the deposits of the sites we are excavating. The crew works together to photograph a 1.5m deep profile in Skiles (top). The 3D model (bottom) was created from 85 photographs. Archaeological excavation and testing is inherently destructive—we are excavating intact deposits that once we are finished will never be intact again. 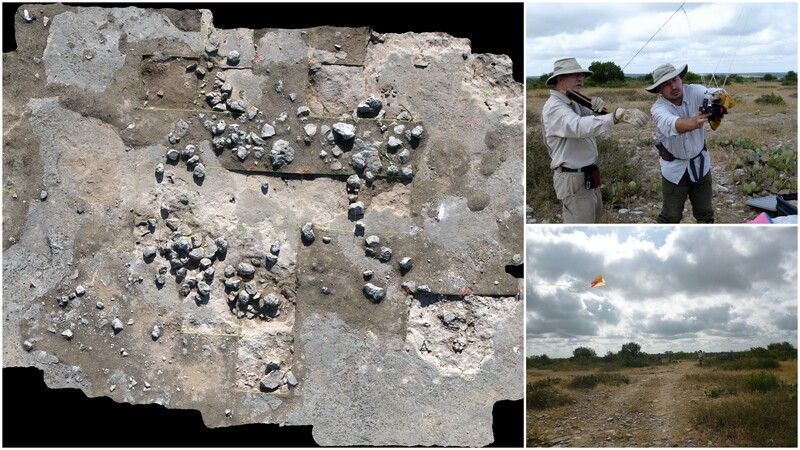 Using SfM, we are able to create a 3D record of not only the archaeological sites, but also the archaeological process. 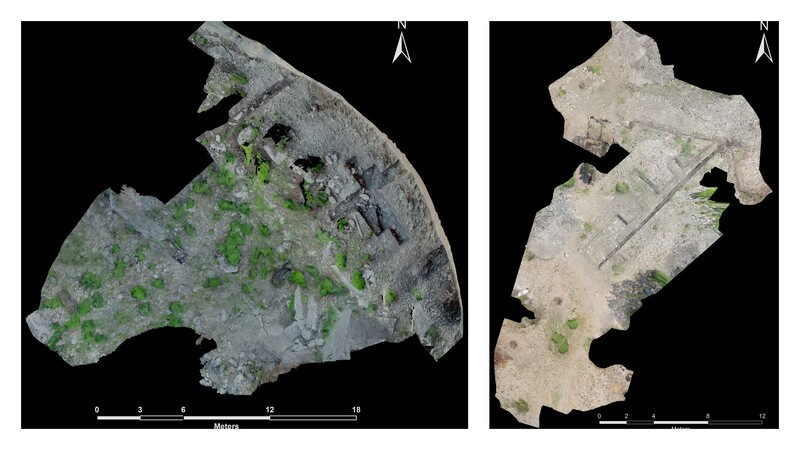 By creating 3D records of each layer, level, and excavation unit we can digitally preserve things that are destroyed through the course of excavation. This is a goal shared by SHUMLA and Texas State’s ASWT Project, and we are both striving to create a 3D digital record of Lower Pecos Archaeology. From burned rock middens to rockshelters and from pictographs to painted pebbles, we are collaborating to document as many sites and artifacts as we can using SfM. Imagine a video game-like environment where you navigate into an unexcavated rockshelter, and walk over to an area where we are currently conducting excavations. With one click of a button you can begin excavating the site just like we did – one layer at a time. 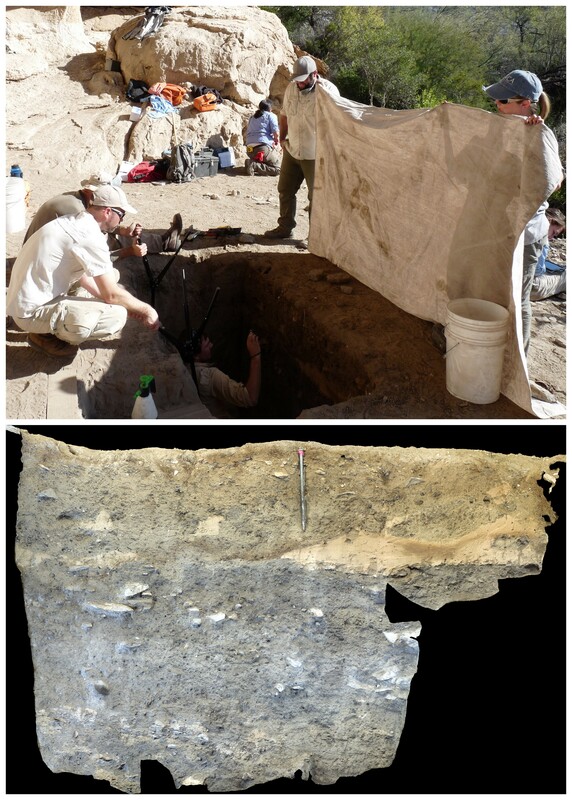 Inside every layer you can appreciate the artifacts, look at the rodent burrows, and ponder the microstratigraphy. Once you finish looking at the dirt, you can turn your attention to the pictographs along the rear wall and begin exploring the data recorded by SHUMLA. We have an obligation as scientists and stewards to both study the archaeology and preserve it for future generations—SfM provides us with a means to begin creating a digital archaeological record to be accessed and studied for generations to come. This entry was posted in Spring ENC 2014 Posts, Structure from Motion. Bookmark the permalink. Reblogged this on Elena Moreno Hansen's Blog. Thanks for the nice explanation of this, Charles. You guys are doing great work! Freaking amazing! Oh to be 20-something again. Charles, when you’re talking sub millimeter accuracy what camera are you using? And what image format are you using? JPEG? Raw? When you talk about someday sharing with the world would that be the pubic at large? Or academia? Hi Chester. You can get sub-millimeter accuracy with any camera, but it will depend on how far away you are from you subject and how large an area you’re trying to photograph. Mark and SHUMLA use Canon SLRs, but we’re just using Nikon and Panasonic point and shoots. We’re in the process of building a website right now and are planning on putting as many 3D models on the internet for everyone to see as we can.